Between 1614 and 1618, he taught theology and philosophy at Nevers, but he returned to Paris and settled at the convent of L'Annonciade in 1620. There he studied mathematics and music and met with other kindred spirits such as René Descartes, Étienne Pascal, Pierre Petit, Gilles de Roberval, Thomas Hobbes, and Nicolas-Claude Fabri de Peiresc. He corresponded with Giovanni Doni, Jacques Alexandre Le Tenneur, Constantijn Huygens, Galileo Galilei, and other scholars in Italy, England and the Dutch Republic. He was a staunch defender of Galileo, assisting him in translations of some of his mechanical works. For four years, Mersenne devoted himself entirely to philosophic and theological writing, and published Quaestiones celeberrimae in Genesim (Celebrated Questions on the Book of Genesis) (1623); L'Impieté des déistes (The Impiety of the Deists) (1624); La Vérité des sciences (Truth of the Sciences Against the Sceptics, 1624). It is sometimes incorrectly stated that he was a Jesuit. He was educated by Jesuits, but he never joined the Society of Jesus. He taught theology and philosophy at Nevers and Paris. He died September 1 through complications arising from a lung abscess. ). It was more accurate (0.44 cents sharp) than Vincenzo Galilei's 18/17 (1.05 cents flat), and could be constructed using straightedge and compass. Mersenne's description in the 1636 Harmonie universelle of the first absolute determination of the frequency of an audible tone (at 84 Hz) implies that he had already demonstrated that the absolute-frequency ratio of two vibrating strings, radiating a musical tone and its octave, is 1 : 2. The perceived harmony (consonance) of two such notes would be explained if the ratio of the air oscillation frequencies is also 1 : 2, which in turn is consistent with the source-air-motion-frequency-equivalence hypothesis. ^ Bohn, Dennis A. (1988). "Environmental Effects on the Speed of Sound" (PDF). Journal of the Audio Engineering Society. 36 (4): 223–231. ^ Simmons, George F. (1992/2007). Calculus Gems: Brief Lives and Memorable Mathematics, p. 94. MAA. ISBN 9780883855614. ^ Bernstein, Peter L. (1996). Against the Gods: The Remarkable Story of Risk. John Wiley & Sons. p. 59. ISBN 978-0-471-12104-6. ^ Connolly, Mickey; Motroni, Jim; McDonald, Richard (2016-10-25). The Vitality Imperative: How Connected Leaders and Their Teams Achieve More with Less Time, Money, and Stress. RDA Press. ISBN 9781937832926. ^ Sergescu, Pierre (1948). "Mersenne l'Animateur". Revue de l'Histoire des Sciences et Leur Applications. 2 (2–1): 5–12. ^ Bernstein 1996, p. 59. ^ Murr, Sylvia, ed. (1997). Gassendi et l'Europe (in French). Paris: Vrin. ISBN 978-2-7116-1306-9. ^ Wilson, Todd (2007), Reflecting Telescope Optics I: Basic Design Theory and its Historical Development, Springer, p. 4, ISBN 9783540765813 . ^ Pendergrast, Mark (2003). Mirror Mirror: A History of the Human Love Affair with Reflection. Basic Books. pp. 88–89. ISBN 0786729902. ^ Grosslight, Justin (2013). "Small Skills, Big Networks: Marin Mersenne as Mathematical Intelligencer". History of Science. 51: 337–374. doi:10.1177/007327531305100304. ^ Koyre, Alexander (1992). Metaphysics and Measurement. Taylor & Francis. p. 100. ISBN 2-88124-575-7. ^ Debus, Allen G. The Chemical Philosophy. ^ Heilbron J. L. (1979)  Electricity in the 17th and 18th Centuries: A Study of Early Modern Physics. This article incorporates text from a publication now in the public domain: Chisholm, Hugh, ed. (1911). "Mersenne, Marin" . Encyclopædia Britannica (11th ed.). Cambridge University Press. Moreau, Roger (2012). 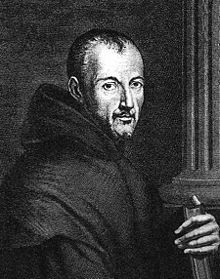 Marin Mersenne et la naissance de l'esprit scientifique. Editions Anagrammes, Perros Guirec. (ISBN 978-2-84719-089-2). Herbermann, Charles, ed. (1913). "Marin Mersenne" . Catholic Encyclopedia. New York: Robert Appleton Company.